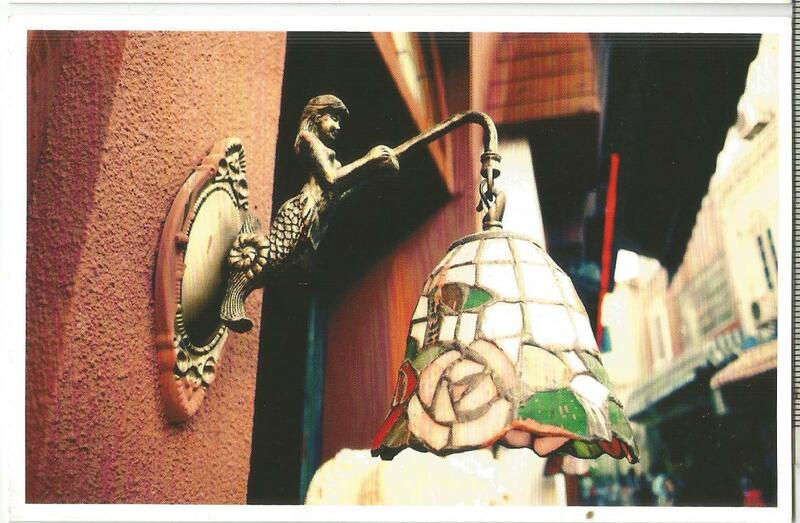 A postcard showing the decorative lamp, most likely at Chongqing (重庆). Thanks Xiaohuoshan. This card was sent together with two others inside an envelope. 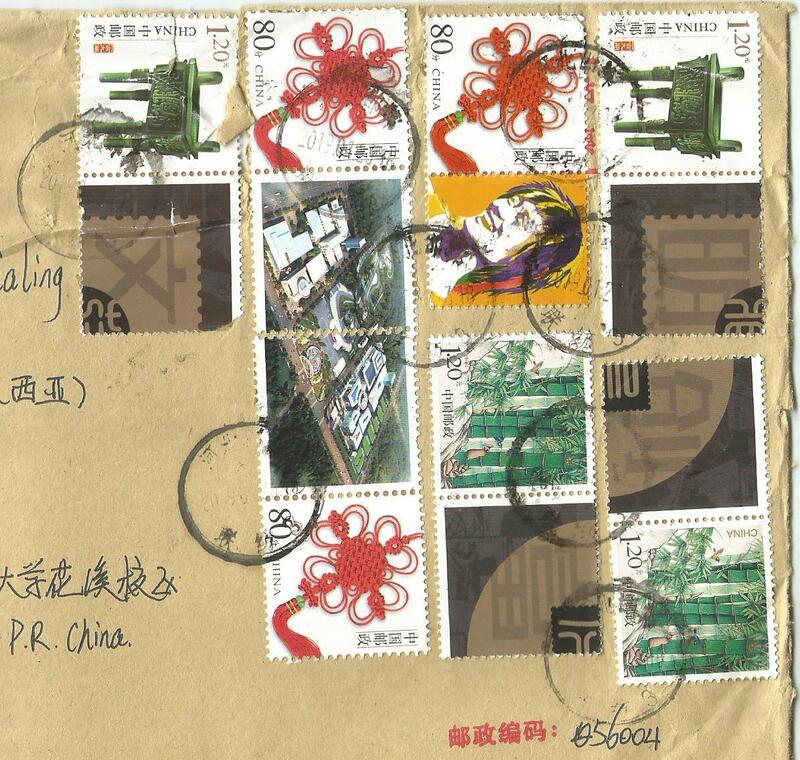 Seven personalized stamps with their tabs were used; Two 1.20 Yuan bronze artifact stamps, two 1.20 Yuan bamboo stamps and three 80 Fen decorative stamps. 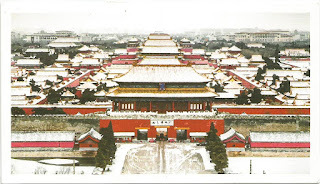 They were cancelled at Hebei Handan Lianfang 3 (河北 邯郸 联纺3) on 23.1.2019. 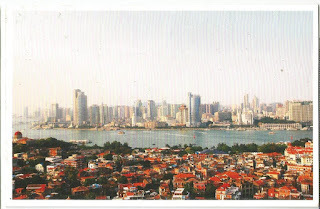 A postcard showing the distinction between a city at the both side of a river, high rise modern buildings at one side and the other side are low rise. 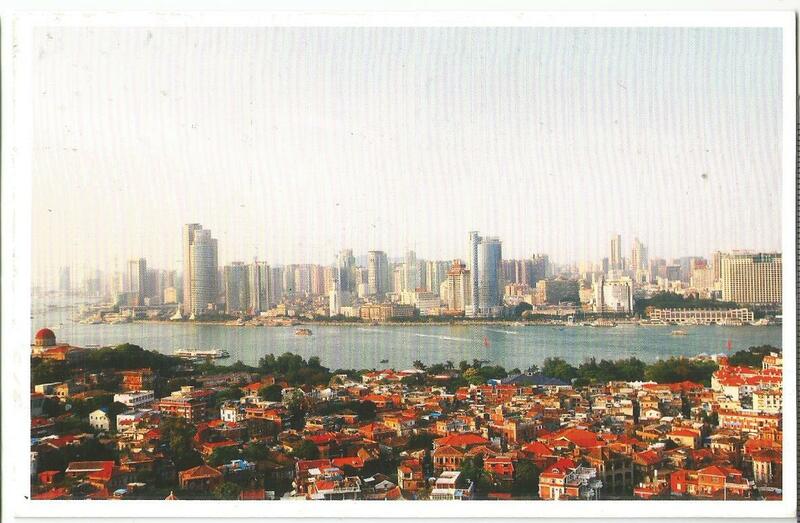 Most like at Chongqing (重庆). Thanks Xiaohuoshan. A postcard showing the winter scenery of the Forbidden City (紫禁城) in Beijing. Thanks Xiaohuoshan. 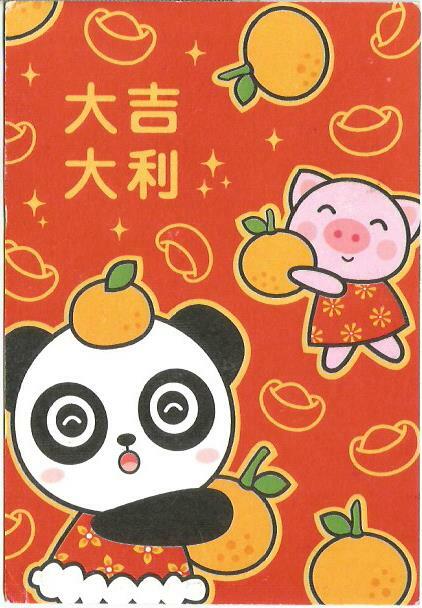 This card was sent but returned to the sender. Four personalized stamps with three of them still intact with theirs tab. A 2.40 Yuan decorative, a 1.20 Yuan bamboo, a 1.20 Yuan seal and a 80 Fen birds decorative. 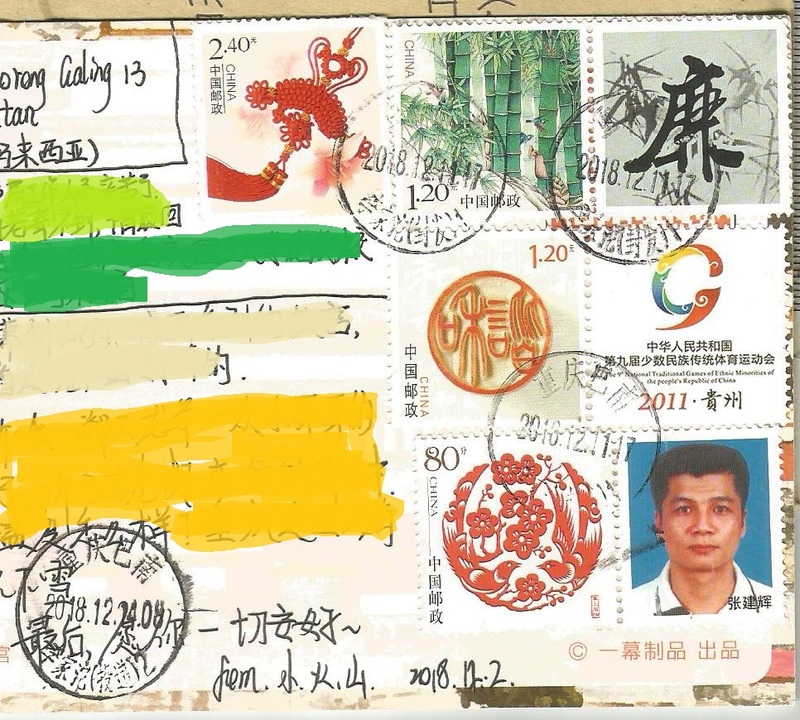 They were all cancelled at Chongqing Ba’nan Lijiatuo (Fengfa) 1 or “重庆巴南 李家沱(封发)1” on 11.12.2018. 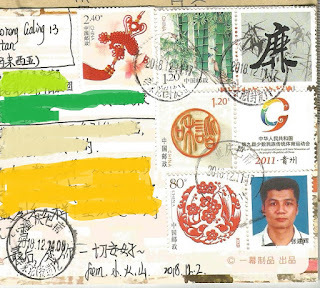 Another cancellation (at the bottom left) from Chongqing Ba’nan Lijiatuo (Toudi) 2 or “重庆巴南 李家沱(投递)2” cancelled it in 14.12.2018. 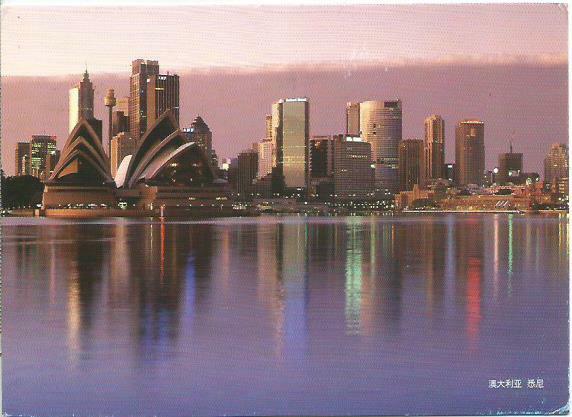 Eventually, this card was sent together inside the same envelope with the other two cards. A postcard showing scenery at Sydney Harbor in Australia with the Opera House and its skyline as backdrop. Thanks liyuan. 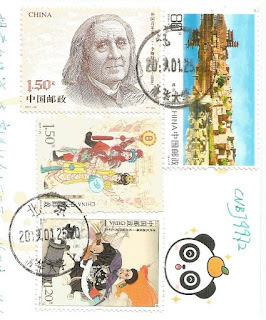 Three personalized stamps were used; they are 3 Yuan bamboo, 80 Fen ship and a 1.20 Yuan stars. They were cancelled at Tianjing Jingjianglu 8 (天津 靖江路8) on 14.1.2019. 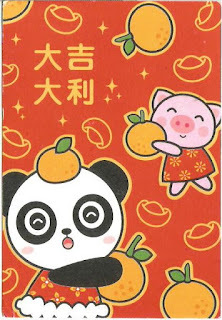 A New Year greeting postcard showing panda and a piglet give mandarin oranges. Thanks Xixi. Several stamps were used; they are 80 Fen scenery (2018-14, 4-1), a 1.50 Yuan musician (2017-22, 4-3), a 1.50 Yuan opera (2017-25, 3-3) and a 1.20 Yuan personality (2018-19, 5-1). They were cancelled at Beijing Qinghua Daxue 1 (北京 清华大学1) on 25.1.2019.